Between the years 1982 and 1990, approximately 4,500 dives have been dedicated to the study of the wreck of the Lomellina; the information collected then is still being investigated and published. Excavations on the Lomellina have represented a significant stage in the field of underwater archaeology. During the exhibition entitled Archéologie de la France, 30 ans de découverte [Archaeology in France, 30 years of discovery] which took place at the Grand Palais in Paris in 1989, these excavations were listed among the 12 most important land and underwater archaeological events of the last 30 years. A first monograph was published by the CNRS: Archaeonautica #9/1989: Le Navire gênois de Villefranche, un naufrage de 1516? [Did the Genoese ship of Villefranche sink in 1516?]. This is still considered as a work of reference for that period. 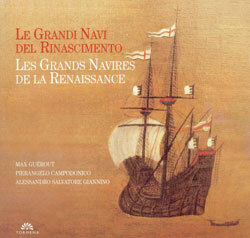 A bilingual document in French and Italian was also published in 2000 in Genoa with the support of the European Commission: Les grands navires de la Renaissance [Great ships of the Renaissance]. It devotes a large section to the Lomellina, and is available on CD-Rom. Many scientific articles have been published. 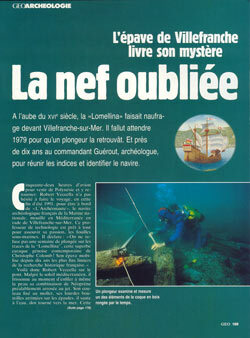 After a page devoted to the Lomellina in the Encyclopaedia of Underwater and Maritime Archaeology, published by the British Museum Press, another article entitled The wreck of the Lomellina at Villefranche-sur-mer came out in Excavating ships of war, a book published by the Oxford University. The French Ministry of Culture also has an information page on the Lomellina excavations on its underwater archaeology website. Many conferences have taken place as well, in France and abroad (Italy, Denmark, Canada, United States). As for Villefranche, it hosted a scientific symposium in 1988 on 16th century ships, in which Canadian and English researchers both participated (wrecks of the Red Bay and the Mary Rose), together with an excavating campaign on the wreck. Several popular exhibitions were organised (in the cities of Ajaccio, Nice, Paris, Nantes, Genoa, Villefranche-sur-mer, Istres, Livorno), the most important of which, after the 1989 Paris exhibition, being Colombo 92, Genoa hosted an international exhibition. The 50 square metres of the French pavilion devoted to the Lomellina were visited by 1,800,000 people. In 2000, an exhibition on the Grands Navires de la Renaissance [Great ships of the Renaissance] was inaugurated in Genoa before being shown in Villefranche-sur-mer and Istres. French and international media have written numerous articles about the Lomellina wreck. Among them, Geo magazine (issue #159 - May 1992) and the Italian magazine Airone (issue #145 - May 1993) are worth noting. Also, Mr. Jean-Yves Blot's book published in 1995 by Découverte-Gallimard, L'Histoire engloutie, ou l'archéologie sous-marine [Engulfed history, underwater archaeology] devotes a whole section on the Lomellina. It has just been published in English and in Spanish. Finally, every television channel in France has broadcast one or more programmes about the excavation campaign, as for example the Telethon which took place in Villefranche-sur-mer, and the programme by France-Culture called Archéologiques. - Max Guérout, Eric Rieth, Jean-Marie Gassend. 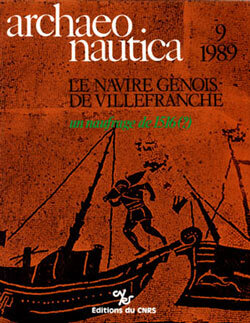 Le Navire génois de Villefranche, un naufrage de 1516? [Did the Genoese ship of Villefranche sink in 1516?], Archaeonautica #9/1989, 171 pages monograph. L'emplanture du grand mât de l'épave du début du XVIème siècle de Villefranche-sur-Mer : un exemple d'emplanture de tradition méditerranéenne, in Medieval ships and the Birth of Technological Societies, vol. II, Villain-Gandossi, C., Busutti, S. & Adal, P. (eds. ), Malta, 1991. p. 179 - 196. La coupe de la Lomellina, in Un goût d'Italie, catalogue of the Argilla 93 exhibition, Aubagne, 1993. p.48. Encylopaedia of Underwater and Maritime Archaeology, articles, Lomellina, London, 1997. Les grands navires de la Renaissance, (bilingual publication : French-Italian), Genoa, 2000. 70 pages. 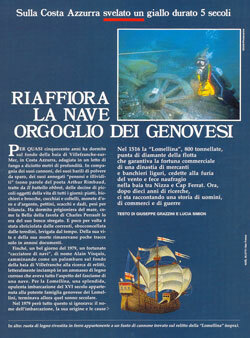 Della Navis Lomellina e del suo Legname – Lo sfruttamento dei boschi genovesi per uso navale (1500-1530), dans Navis, Numero 2/2000, p12-35. Article Lomellina dans International Handbook of underwater archaeology, New-York, 2002, p. 441-442.